The greatest doubles team of all-time was in San Francisco Thursday to celebrate the closing of Golden Gate Park’s 125-year-old tennis complex. They weren’t celebrating what was, but rather what will be. In two weeks, the historic Golden Gate Park Tennis Center will shut down. Indeed, change is coming, but in this case, it’s for the better. 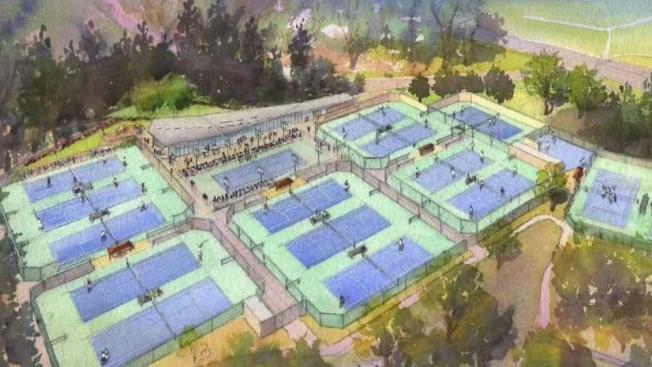 "Our goal here is nothing short of the best public tennis facility in the United States," said Phil Ginsburg, general manager of San Francisco Parks and Rec. The project is nine years in the making and will come to fruition towards the end of 2020. The $27 million needed to make it a reality was achieved only recently. "We were out of the starting block, and then we’d get stuck," said Lois Salisbury of the San Francisco Tennis Coalition. "And then we’d move forward, and then we’d get stuck. But fortunately the dam broke, to mix my metaphors, and here we are, ready to break ground." Ginsburg noted that Golden Gate Park has had tennis since the 1890s, and the facility is showing its age. The renovated center will have 17 lighted courts, making for an extra 20,000 hours of play per year. "We’re going to have an amazing stadium court and a beautiful new clubhouse that honors San Francisco’s proud tennis history," Ginsburg said. That history includes Billie Jean King, Rosie Casals and Brad Gilbert. And, of course, the most prolific doubles team in U.S. history and the guests of honor Thursday: Bob and Mike Bryan. The Stanford grads are fresh off another tournament title this past weekend in Miami, and little did they know when they arrived that their A-game would be needed on Thursday as well. "We played about 10 teams. Yeah, they were good," Mike Bryan said. "There’s a lot of talent up here in the Bay Area. We’ve actually never lost, but we were on the verge of losing. He had to hit a couple 130 (mph) serves. Had to ace a couple kids. We’re nasty. We’re mean. Mean twins. But we hate to lose." Whether it’s on the court or the courts themselves. "We hate to see places lose courts," Bob Bryan said. "You’re seeing it all the time in these big cities. Corporations coming in, putting in parking lots. Getting rid of the memories. And there’s a legacy of legends on these courts, so it’s amazing. We’re not losing it. We’re only going to make it better here."